It's easy to be blinded by the huge checks billionaires cut for charity, especially when what they give away in a year is probably many millions or billions more than you'll earn in an entire lifetime. But just because some mega-wealthy donor is regularly throwing money at good causes doesn't mean they're remotely the most philanthropic among the rich folk. Fortunately, someone out there is keeping score, and now there's a handy new chart that makes it easy to compare just how generous various fat cats are with their cash. The team at HowMuch put together a nifty visualization that illustrates just how generous the wealthiest 30 people in the United States are with their fortunes by looking at a number of factors. Specifically, they consulted the Forbes 400 Richest Americans data to determine net worth, estimated lifetime giving, and the percentage of their fortunes they've given away. They also included something called a "Philanthropy Score" (between 1 and 5), which Forbes assigns to each person on their list, and plotted that on the chart as well. 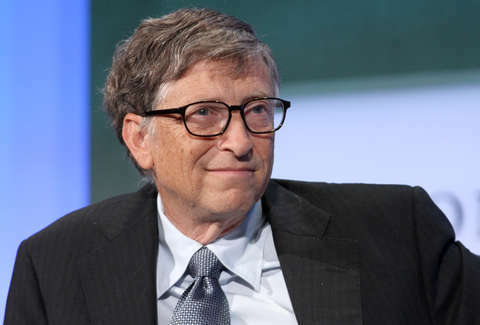 The methods by which a Philanthropy Score gets assigned are a bit nebulous, but essentially it's derived partially based on how much of money one's given away as it relates to their net worth and also their involvement with The Giving Pledge, a the movement led by Bill and Melinda Gates where billionaires promise to give away at least half of their fortunes. 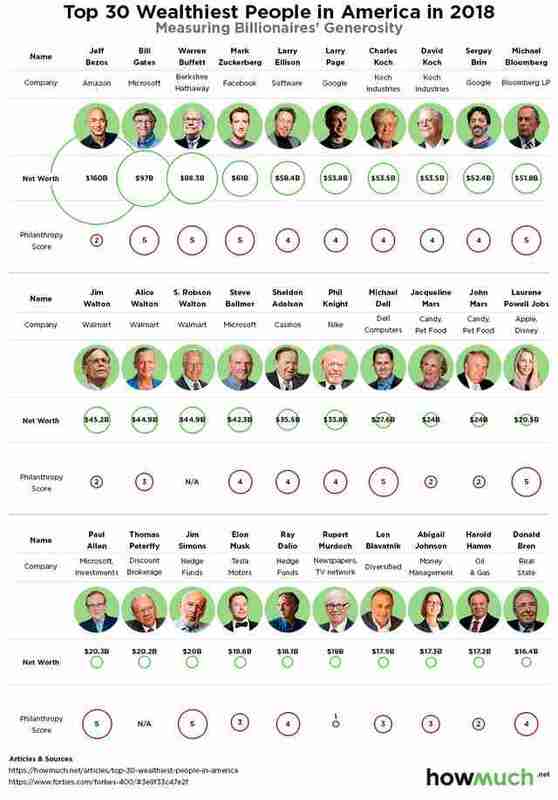 Interestingly, while Jeff Bezos is the richest American at the moment and worth a staggering $160 billion, his philanthropy score is only 2. Meanwhile, the late Paul Allen had a relatively modest net worth of $20.3 billion, but earned a Philanthropy Score of 5. However, as Forbes points out, it's worth noting that the Scores don't count pledges or announced gifts that have yet to be paid out (e.g., if Bezos had already paid the $2 billion he recently pledged to start preschools and help homeless families, his score would have been a 4). As HowMuch points out, in order to get a top score of 5, a person needs to give away at least $1 billion and/or 20% of their net worth, which is why there are so few 5s at the top. In fact, only 29 of the people among the 400 richest hold that distinction. It's also worth noting that while George Soros is no longer among the top 30 richest people in America, it's partly because he's given so much of his money away in recent years. He's actually given away more than any other person on the list in percentage terms, totaling $32 billion, or 79% of his wealth. And while any amount you can pony up for charity is undeniably worthwhile, just let all those zeroes sink in next time you're walking tall after donating $25 to St. Jude's.